Lexie Elwell is an Account Services Associate at Balentine. She has experience in the real estate and insurance industries. Most recently, she was an inside claims representative at Capstone ISG. 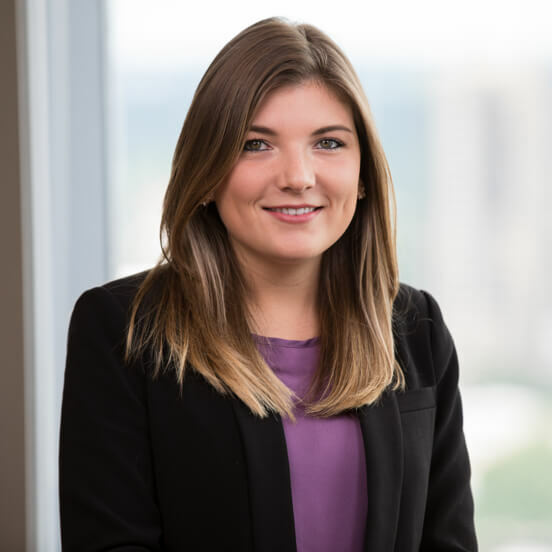 Prior to that, she was a leasing consultant for Post Properties in Houston, TX and Atlanta, GA. Lexie is a graduate of the University of Georgia, where she received a Bachelor of Science in Family and Consumer Sciences. An avid tennis player, Lexie is a member of the Atlanta Lawn Tennis Association (ALTA) and the United States Tennis Association (USTA). I would likely be working in the real estate industry. It’s a field that allows you to help people and also provides investment opportunities. Who were your heroes growing up and how did that influence your life and career? My mom is my greatest hero. She raised me as a single mother, and growing up, I witnessed her devotion to her family and her career. Watching her balance all aspects of her life so well instilled within me a lifetime of values that I will always follow. I enjoy playing tennis, trying new restaurants, and going to concerts with friends. Turning down a tennis scholarship from a small college in favor of attending UGA, where I believed I would be more academically challenged. While I don’t regret my decision, I do think that it would have been a great opportunity.